Why do we hear only of the "humanitarian crisis in Aleppo" and not of the humanitarian crisis everywhere else in Syria where the evil that rules in Washington has unleashed its ISIL mercenaries to slaughter the Syrian people? Why do we not hear about the humanitarian crisis in Yemen where the US and its Saudi Arabian vassal are slaughtering Yemeni women and children? Why don't we hear about the humanitarian crisis in Libya where Washington destroyed a country leaving chaos in its place? Why don't we hear about the humanitarian crisis in Iraq, ongoing now for 13 years, or the humanitarian crisis in Afghanistan now 15 years old? The answer is that the crisis in Aleppo is the crisis of Washington losing its ISIL mercenaries to the Syrian army and Russian air force. The jihadists sent by Obama and the killer b*tch Hillary ("We came, we saw, he died") to destroy Syria are being themselves destroyed. The Obama regime and the Western presstitutes are trying to save the jihadists by covering them in the blanket of "humanitarian crisis." Such hypocrisy is standard fare for Washington. If the Obama regime gave a hoot about "humanitarian crisis," the Obama regime would not have orchestrated humanitarian crisis in Syria, Iraq, Afghanistan, Libya, and Yemen. No one has asked why the White House Fool is empowered to remove the president of Syria by siccing US-supplied jihadists, which the presstitutes misrepresent as "moderate rebels," on the Syrian people. 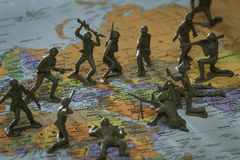 The answer to the question is that Washington's strategy for destabilizing Iran and then the Muslim provinces of the Russian Federation, former Soviet central Asia, and the Muslim province of China is to replace stable governments with the chaos of jihadism. Iraq, Libya, and Syria had stable secular societies in which the government's strong hand was used to prevent sectarian strife between Muslim sects. By overthrowing these secular governments and the current effort to overthrow Assad, Washington released the chaos of terrorism. Jihadists such as those that Washington used to overthrow Gaddafi appeared in Syria when the British Parliament and the Russian government blocked Obama's planned invasion of Syria. As Washington was prevented from directly attacking Syria, Washington used mercenaries. The prostitutes that pretend to be an American media obliged Washington with the propaganda that the jihadist terrorists are Syrian democrats rebelling against "the Assad dictatorship." This transparant and blatant lie has been repeated so many times that it now is confused with truth. Syria has no connection whatsoever to Washington's original justification for introducing violence into the Middle East. The original justification was 9/11, which was used to invade Afghanistan on the fabrication that the Taliban was shielding Osama bin Laden, the "mastermind," who at the time was dying of renal failure in a Pakistani hospital. Osama bin Laden was a CIA asset who was used against the Soviets in Afghanistan. He was not the perpetrator of 9/11. And most certainly, neither were the Taliban. But the Western presstitutes covered up for the Bush regime's lie, and the public was deceived with the phrase that we must "defeat them abroad before they attack us at home." Of course, Muslims were not going to attack us at home. If Muslims are a threat, why does the US government keep bringing so many of them here as refugees from Washington's wars against Muslims? 9/11 was the neoconservatives "new Pearl Harbor" that they wrote they needed in order to launch their wars in the Middle East. George W. Bush's first Secretary of the Treasury said that the topic of Bush's first cabinet meeting was the invasion of Iraq. This was prior to 9/11. In other words, Washington's wars in the Middle East were planned prior to 9/11. The neoconservatives are zionists. By reducing the Middle East to chaos they achieve both of their goals. They remove organized opposition to Israeli expansion, and they create jihadism that can be used to destabilize countries such as Russia, Iran, and China that are in the way of their exercise of unilateral power, which, they believe, the Soviet collapse bequeathed to the "indispensable nation," the USA.